It’s me, the guy who thinks Sidney Crosby doesn’t get the attention or credit he deserves for his play. No wait, don’t leave! You could make a very strong argument that last night’s 4-1 Game 4 loss was the best game the Penguins have played all series. (They were only outshot by two, after losing the SOG battle by a combined 30 in the first three games, two of which they won.) Pittsburgh had a number of very good chances, often on breakaways, and often by Crosby, who played his best finals game in eight years. Most obviously, Crosby scored his first SCF goal since Game 4 in 2009, and it was a beauty. It’s tough to follow Crosby’s deke, or dekes—I had to make this gif just to watch it over and over—he goes front to back to front to back, hiding the puck behind his blade and getting Pekka Rinne to bite and drop to his knees before switching it up one more time and finishing with with a backhand. You’d teach a young player to do just that when in alone on a goalie, but not many players have that kind of stick control. As impressive as that was, I might be even more taken by Crosby setting up Jake Guentzel in the second for what, more often than, would have been a go-ahead goal. It wasn’t here—Rinne got across and Guentzel didn’t elevate the puck enough, a departure from his excellent finishing this postseason—but that doesn’t mean Crosby wasn’t out here making plays. Crosby outworks Roman Josi in the corner and kicks the puck onto his stick, before sending a perfectly placed pass just between two Predators to Guentzel in front. Later in the second, Crosby again made things happen. 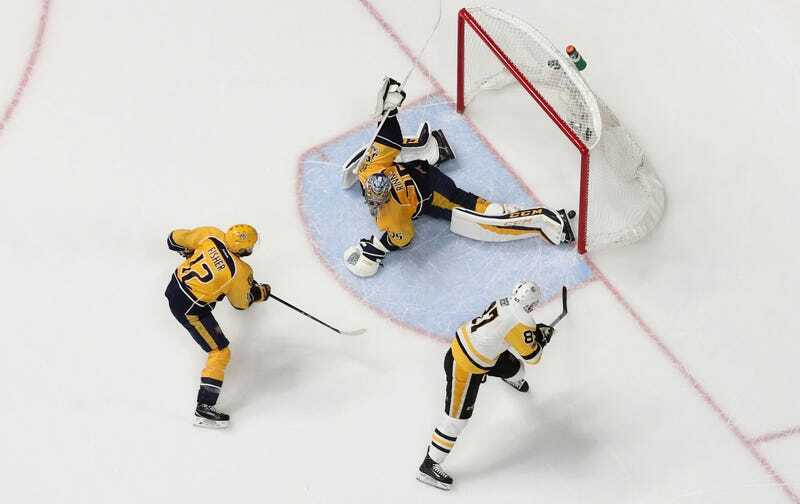 He blocked a Ryan Ellis shot and outskated both Nashville defensemen the other way, getting stuffed twice by Rinne but leading to a rebound chance by Jake Guentzel that only a fully horizontal dive by Rinne kept from being the tying goal. That only one goal came from these three plays is the breaks of the game, and the result of to a killer performance from Rinne. But that doesn’t change the fact that Crosby singlehandedly created three wonderful chances in a Stanley Cup final game, against the top pairing of one of the league’s best defenses that’s been able to sell out to stop him because the Penguins just aren’t getting any depth scoring. The top forwards—Crosby, Malkin, Kessel, Guentzel, and Bonino, who’s currently on crutches—have been great, and that’s about it. These aren’t the three- or four-lines deep Penguins of even last year, and the defense, crippled by the loss of Kris Letang, has been a no-show in the offensive zone. In what’s now a best-of-three series, it’s hero time. Crosby played like one last night, and even that wasn’t enough.